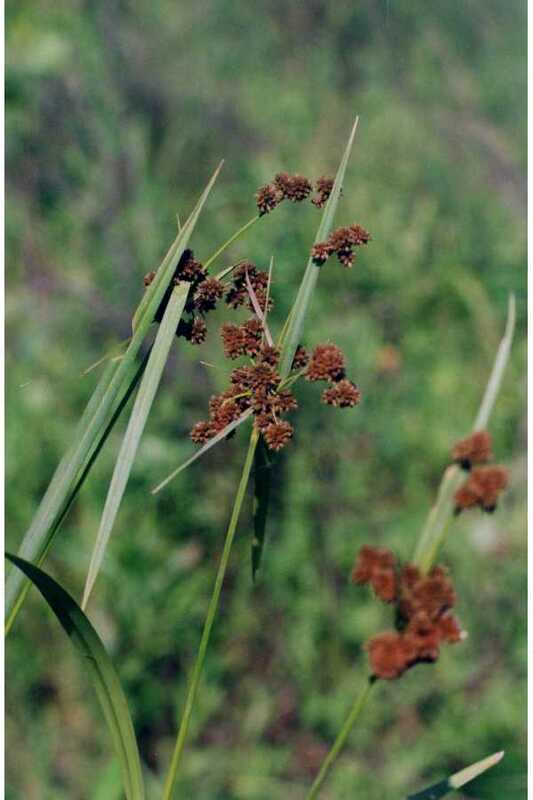 Scirpus atrovirens.Jennifer Anderson @ USDA-NRCS PLANTS Database (Accessed 5/2014). Scirpus atrovirens is a perennial rush; tufted, to 1.5 m tall, dark green; rhizomes short, tough; stems 3-sided. Leaves of flowering stems as many as ten, mostly below middle, to 1.8 cm wide; lower sheaths with short cross-veins (septate-nodulose). Flower spikelets egg-shaped 0.2-0.8 cm, scales to 0.2 cm, blackish with green midrib ending in point; inflorescence usually open, branched once or twice, heads rounded, crowded, often pale whitish green, becoming much darker at maturity; fruit (achenes) very pale, 3-sided, 0.1 cm; blooming and fruiting June-Sept. Seeds eaten by mice and some birds (Hilty 2006). Habitat: Wet meadows, often along path edges, moist to wet bright forest understories, ditches, marshes and pond edges, soil pH 4-8 (USDA, NRDC 2010). Quite shade tolerant (personal observation). Notes: Plants eaten by muskrats (Hilty 2006).